It was exactly as shown. Really love it. My boyfriend thinks it’s great quality and very well made. It was a present for him for Xmas. I was so excited to give it to him that I cldnt wait for Xmas to give it. A wonderful product. Worth the buy! 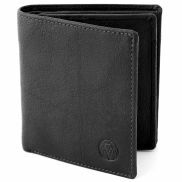 It’s hard to get small Vertical Wallets so I was thrilled with the product.